I'm so excited to announce that Stampin' Up! 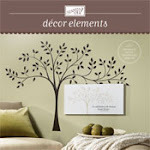 is introducing a new product line called "Décor Elements". What is this new product? It is a line of wall art using Stampin' Up! designs made from vinyl used to decorate your home. They are self-adhesive vinyl wall decorations that can be used on walls, windows, plates, vases, mirrors, picture frames - anything the vinyl will cling to! The possibilities are endless! They coordinate with Stampin' Up! stamps so that you can personalize your home combining these two elements and creating beautiful handcrafted home decor pieces that make a statement and make it uniquely yours. These vinyl wall decorations are easy to apply and to remove. This exciting new product line will be available to customers on July 1st. I can begin accepting orders for these products then. I will have brochures available in the next week or so. Please email me if you would like one. I'd be happy to get one to you! I can't wait to order some of these products for myself! I can think of many areas in my home that they can be used. How exciting! Paige's kindergarten teacher will love getting this card from her this year. You came up with a beautiful design.